1 Rectangular Table 59Lx36Wx29H 4 Stacking Armchairs 23Wx23Dx36H .Seat Dimensions:16.5Wx17Dx18H. The VITTORE outdoor collection brings style and elegance to the backyard. Your seasonal dining room will be inviting to family and friends. Sleek modern elements are coupled with natural wood look. Comfort is guaranteed with this great garden furniture set. The patio dining set is made from a rust-free aluminum frame and durable polywood slats. The advantages of this material is its durability and convenience. It is solid and looks like wood, but will not weather the way its natural counterpart would. This weather resistant set allows you the freedom to dine outdoors with your family virtually no maintenance. Put it out in the spring and you have dining for 3 seasons! 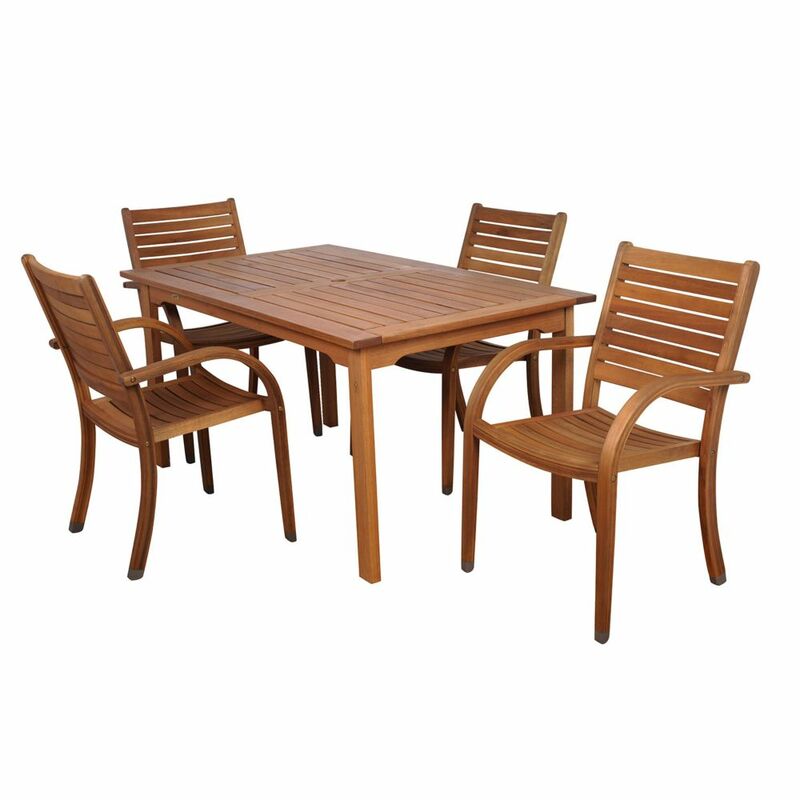 The Bradley Outdoor Patio 5-piece Wood Dining Set is designed to be maintenance free. Every piece is carefully Finished with a beautiful, multi-coated and weather-resistant paint that will not fade due to over exposure in the sun. It will maintain its new look from the first day and for years to come. Made from 100% Acacia Hardwood that is native to Australia and Asia, and used in the construction to make excellent and high quality furniture that resists mold, mildew, fungi, termites, rot, and decay. Comes in beautiful White Painted Finish, this set will bring your outdoor patio a classic charming look, sounds perfect! Arizona Eucalyptus Wood 5-Piece Rectangular Patio Dining Set The Amazonia Collection is committed to providing premium quality sets with an elegant design that will make your home stand out above the rest. Crafted from solid Eucalyptus Grandis wood, grown in 100% managed forests in Brazil and certified by the FSC (Forest Stewardship Council), this eucalyptus furniture is known for its longevity and craftsmanship at an affordable price. Enjoy your patio in style with these great sets from our Amazonia Collection. Arizona Eucalyptus Wood 5-Piece Rectangular Patio Dining Set is rated 4.5 out of 5 by 2. Rated 4 out of 5 by Chuck from The set is very nice but there is a defect... The set is very nice but there is a defect in the table top. It appears to have cracked and is lifting and requires replacement or repair.